Republican Candidate for Coroner. 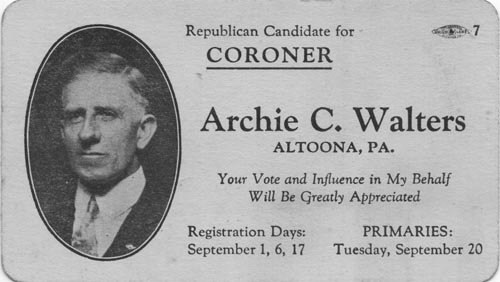 Archie C. Walters, Altoona, Pa. Primaries: Tuesday, September 20. Your Vote and Influence in My Behalf will be Greatly Appreciated. Are you looking for WALTERS ancestors? If so, we suggest posting a query to our Community Message Board to get assistance from other researchers.